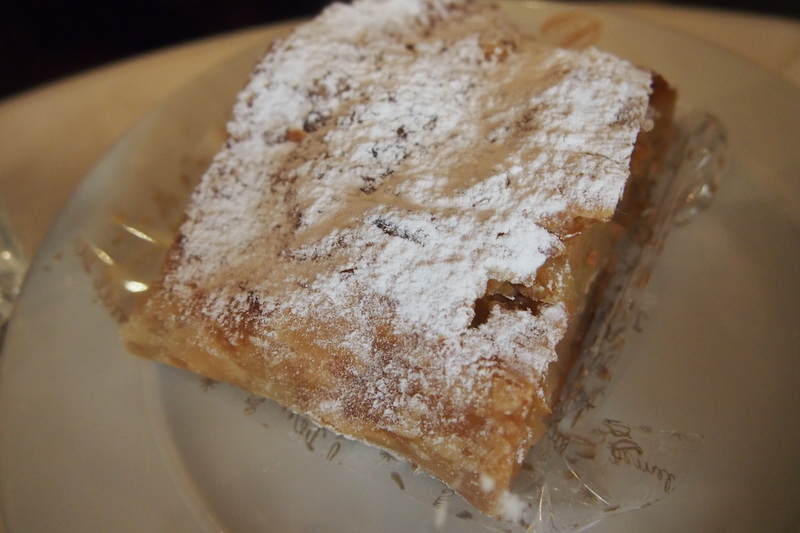 If I have to sum up my entire visit to Prague in one word, it would be romantic. It is so beautiful and so firmly entrenched in the past that you cannot but view it with none other than rose-colored glasses. And one cannot deny that it seems shrouded in mystery, like most of its sister countries in the Carpathians. Or maybe it’s just me – I tend to associate this region with my never-ending fascination with vampiric lore (way before Twilight, True Blood and The Vampire Diaries made it cool), given that Dracula lives in the mountains of the Carpathians and I will forever think of it in terms of magic and everything unreal. 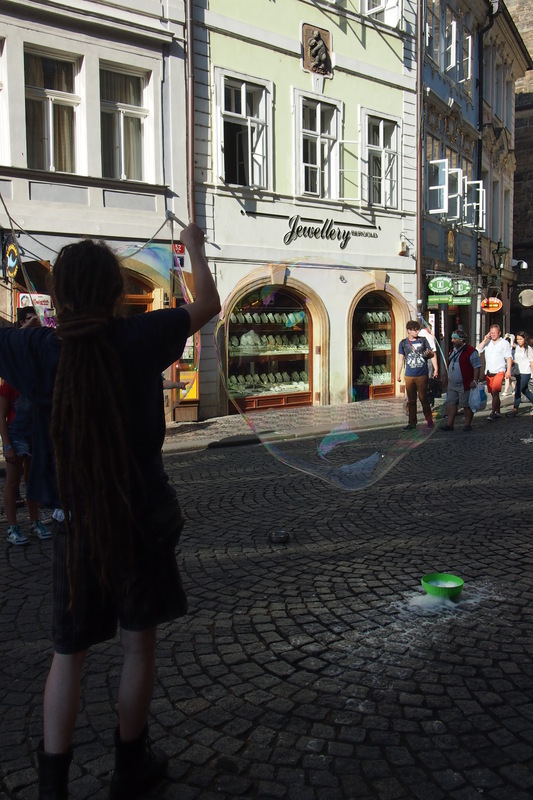 Anyway, the historical/tourist area of Prague is quite small – you can reach all on foot or for the walking-averse set, take a short tram ride. I recommend the former as the experience is just all the more worthwhile and you get to see the lovely sidestreets and locals going about their daily routine. And as I mentioned, it is very compact. 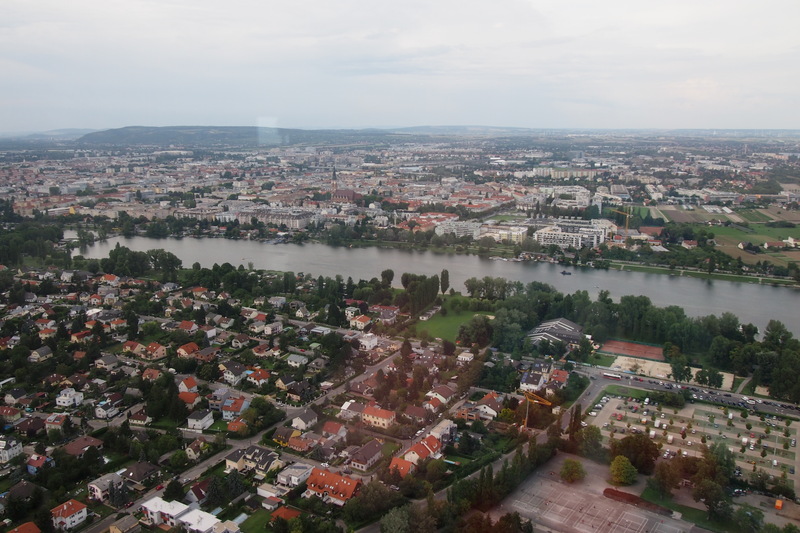 The city is divided into two main parts, each sitting on one bank of the river Vlatava – the Lesser Town or Mala Strana, where Prague Castle is located, and the Old Town or Stare Mesto, where the town square with the famous astronomical clock is. 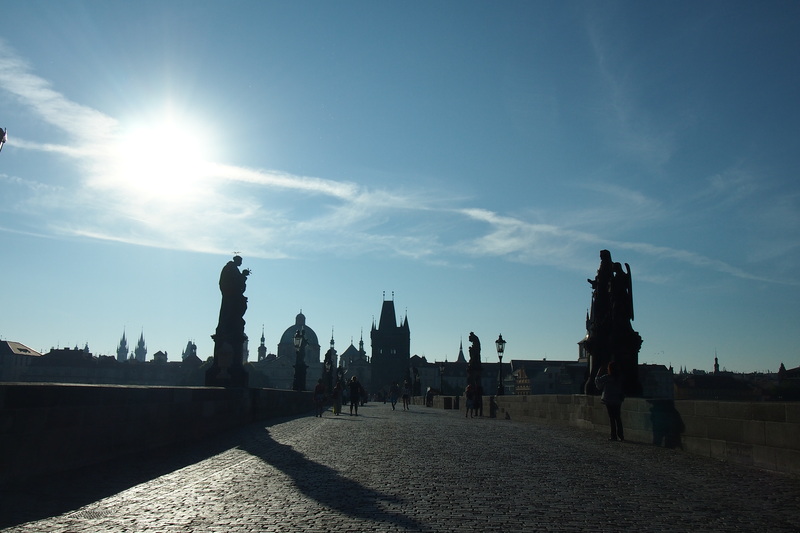 Linking the two sides of Prague is one of the most famous bridges in the world – Charles Bridge or Karluv Most. 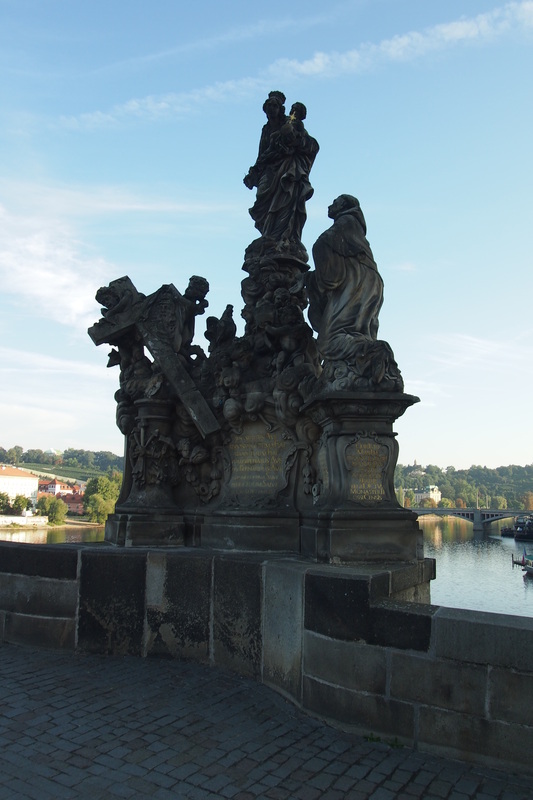 There are many other bridges linking the two, of course, but none of them quite reached the importance of the Charles Bridge, which was, until 1841, the only means of crossing the Vlatava. Sidenote: Most actually means bridge in the local language and I finally figured this out after looking at our map and seeing this label on all the bridges. Commisioned by King Charles IV to replace the old Judith Bridge which collapsed during the flood in 1342, construction on the Charles Bridge began in 1357, with the king’s favourite architect Peter Parler overseeing the work. According to legend, egg yolks were used in the construction of the bridge and that King Charles himself laid the first stone at a specific time because of his strong belief in numerology and that this would render the bridge with more strength. Considering that the bridge is now 700 years old and has survived countless wars, revolts, and yes, floods, there might be some credence to those beliefs after all. The bridge is more than half a kilometer long and entrance to it is marked by three towers – two on the Mala Strana side and one on the Stare Mesto side. 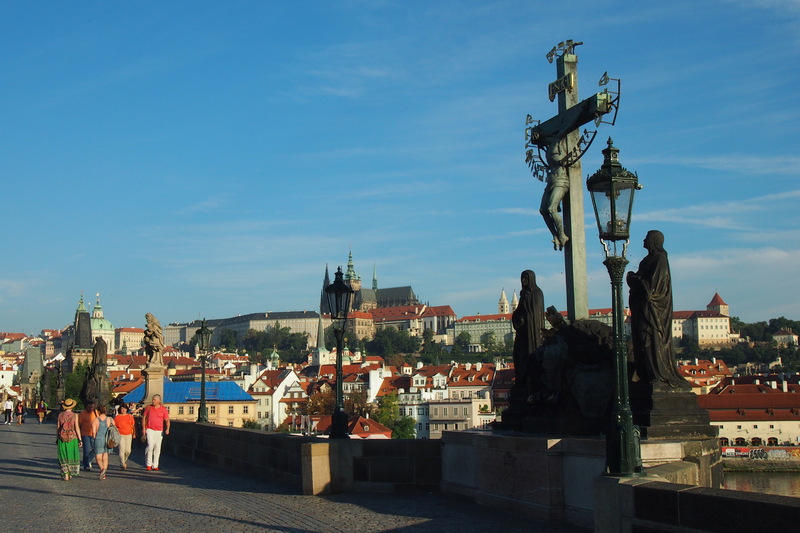 The Old Town bridge, completed in 1380 and which serves as the entrance to the Stare Mesto, is a masterpiece of Gothic architecture with sculptures by Peter Parler adorning its facade. 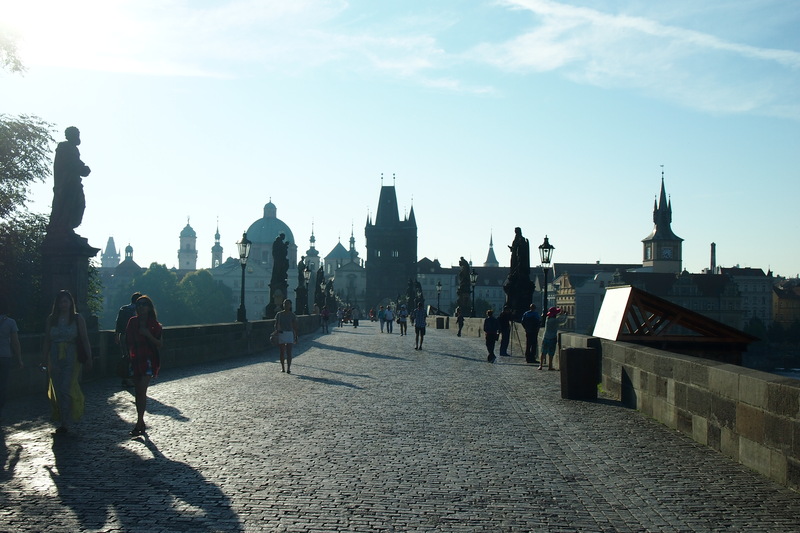 Climbing the 138 steps to the gallery allows you to have unobstructed views of the bridge from the top, as well as the Prague Castle on the other side of the Vlatava. Too bad though, that when we were there, we either get there too early or too late for the opening of the gate so I wasn’t able to climb up. 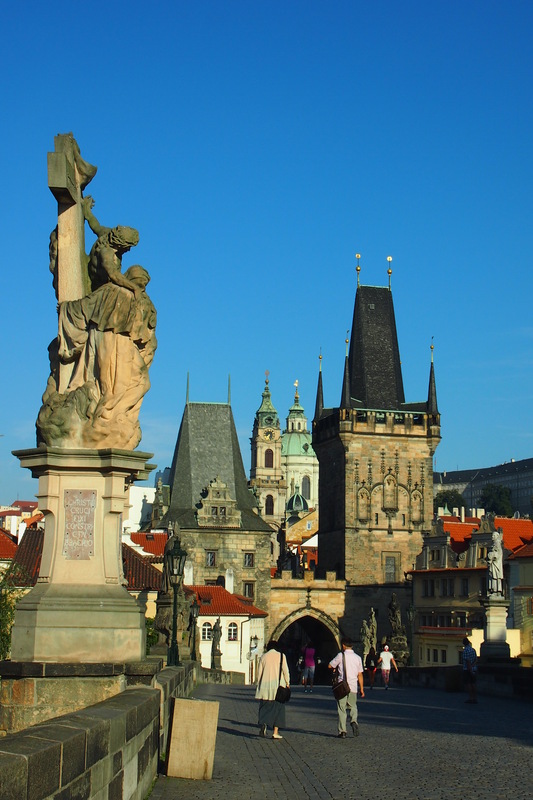 The Lesser Town Bridge, on the hand, serves as the entrance to the quieter side of Prague – the Mala Strana. It was built later than the Old Town Bridge, in the first half of the 15th century during King George’s rule. 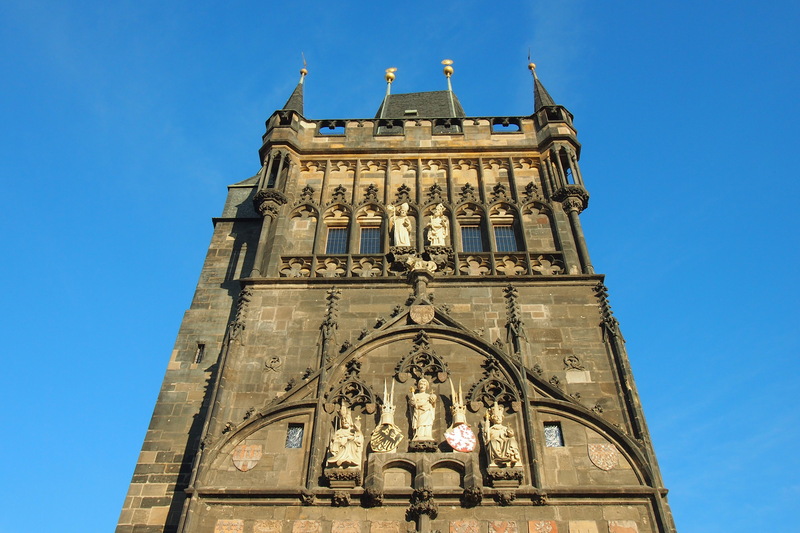 Visitors can likewise climb up the tower, this time for views of the Old Town from across the Vlatava. 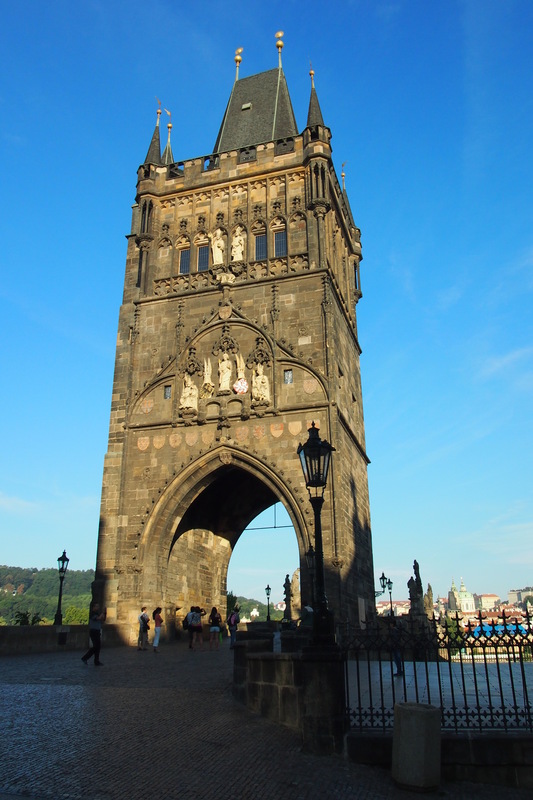 If you look at the tower closely, you will notice that there is actually a smaller tower connected to it by a walkway – the Judith Tower, which is the only surviving part of the old Prague bridge. 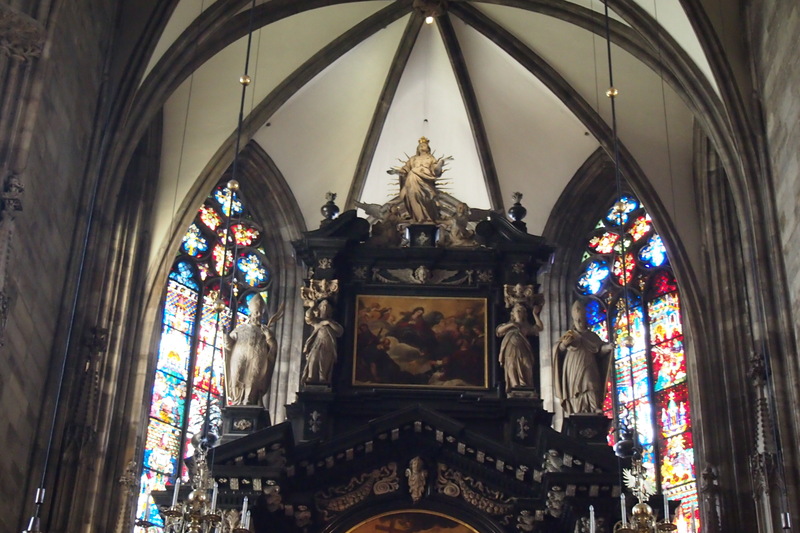 Initially just a simple bridge with just a crucifix in the middle, baroque statues were placed during the 17th century, when such themes became prevalent. The 75 statues on the bridge are now all replicas – the original ones are now so badly damaged that they’ve been taken down and kept on display at the Lapidarium. Both sides of the bridge are fascinating but the Mala Strana, an old marketplace which began its life in the 8th century (! 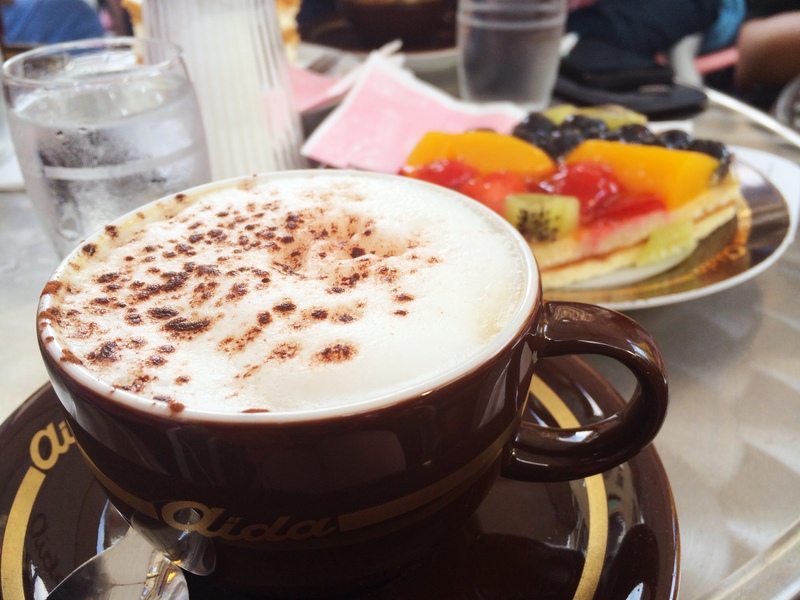 ), is less crowded and in my opinion less commercialized – there are various cafes and shops showcasing works by local artists as well as jewelry stores with oh-so-lovely pieces in silver and lovely blood-red garnet, which is the official national gem. And pretty cheap too! When I checked in some of our jewelry stores here in Manila, they were all ridiculously priced that I now wish I’d hoarded garnet jewelry during my trip. Oh well, there is always a next time. And I can’t get over how clean the entire city was. Usually, old towns such as this would reek of horse urine and the like but I was surprised to see water tanks regularly drizzling the cobblestoned streets with clean water. 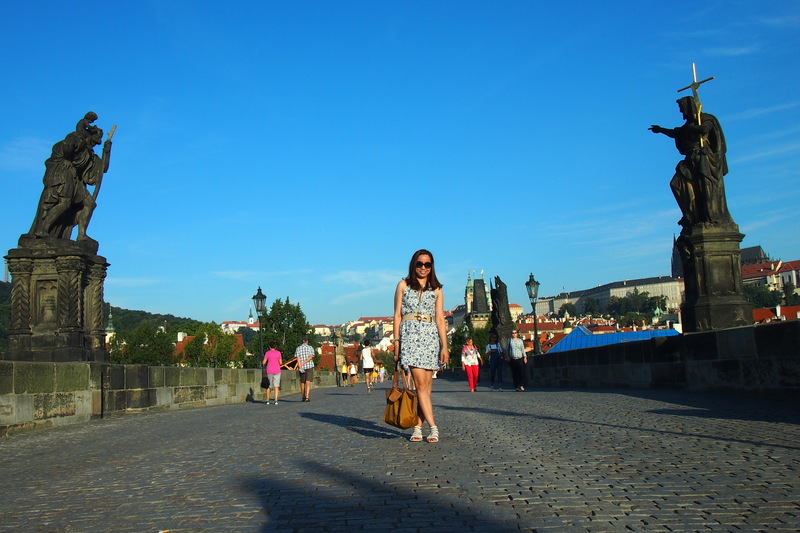 We visited the Mala Strana quite a number of times – first was to go to the Prague Castle (more on that later), and several to visit the Church of Our Lady Victorious and the miraculous image of the Infant Jesus of Prague. The Church of Our Lady Victorious, while seemingly austere on the outside, is the first Baroque church in Prague, built in 1613. 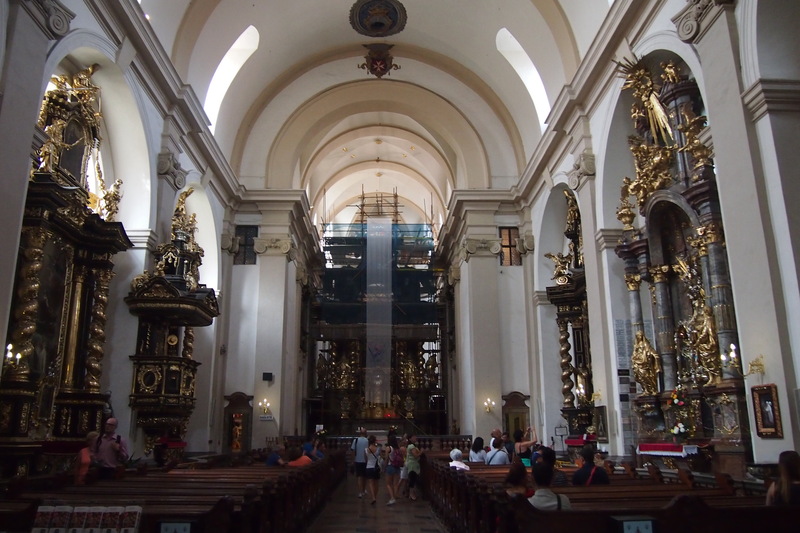 It was originally called the Church of the Holy Trinity and was supposed to be used by the German Lutherans. It was given to the Carmelites in 1620 as a sign of gratitute for their victory in the Battle of the White Mountain, and the church was rebuilt and its orientation changed tot he form we see today. 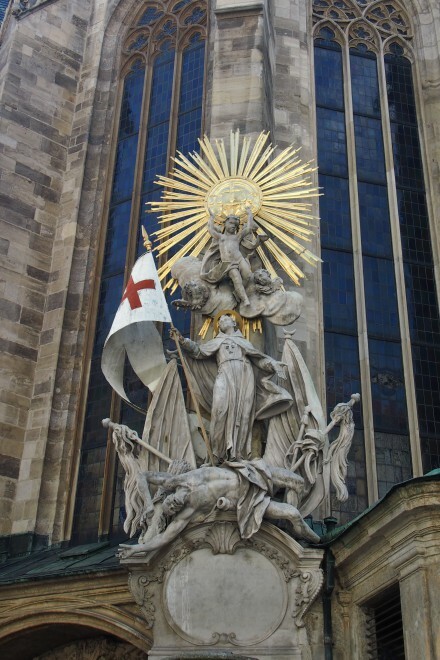 The exact history of the statue is not known but its first appearance was in 1556, when the statue was brought from Spain to the Kingdom of Bohemia (of which the Czech Republic used to be part of) by Spanish princess Maria Manriquez de Lara y Mendoza upon her marriage to the Czech nobleman Vratislav. 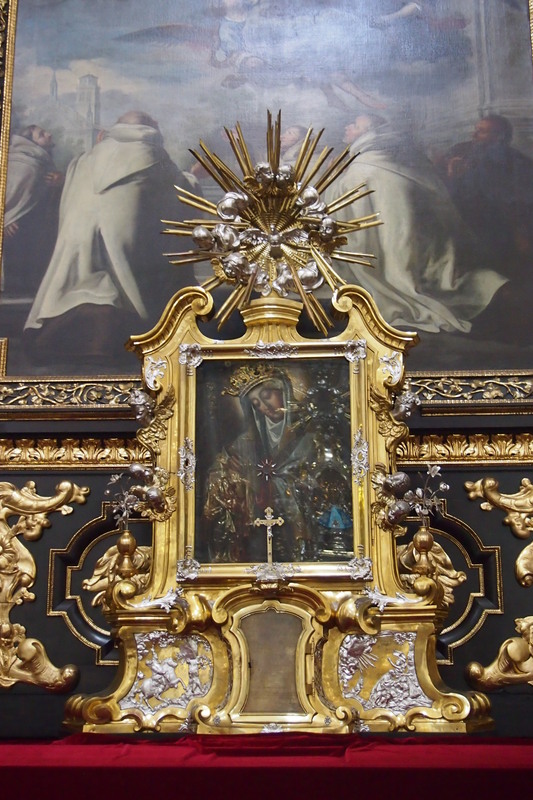 It is said that the statue was a gift from St. Terese of Avila to her mother; she later gave it to her own daughter Princess Polyxena, who in turn donated it to the Carmelite Friars in 1628. 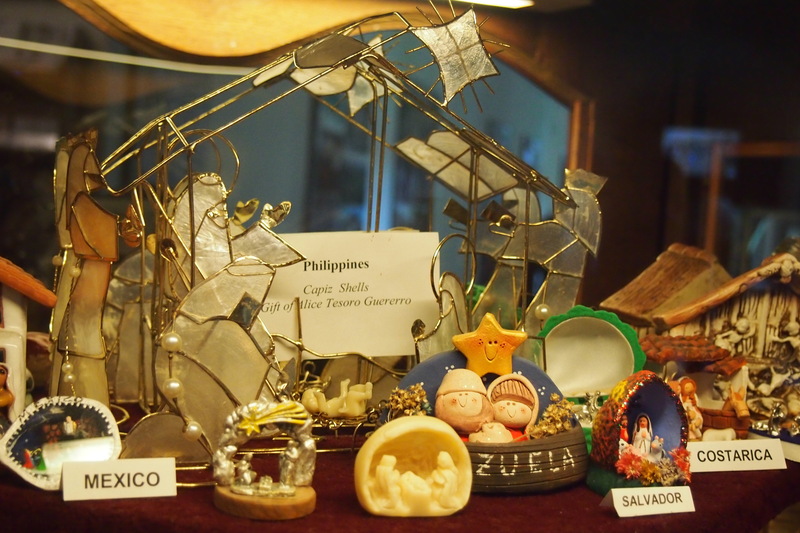 The 19-inch statue is made of wax-coated wood with it lower part encased in silver; it is similar to other sculptures of the Infant Jesus brought by Spanish missionaries to their conquered lands – it resembles the Sto. Nino de Cebu, itself a venerated statue in the Philippines. 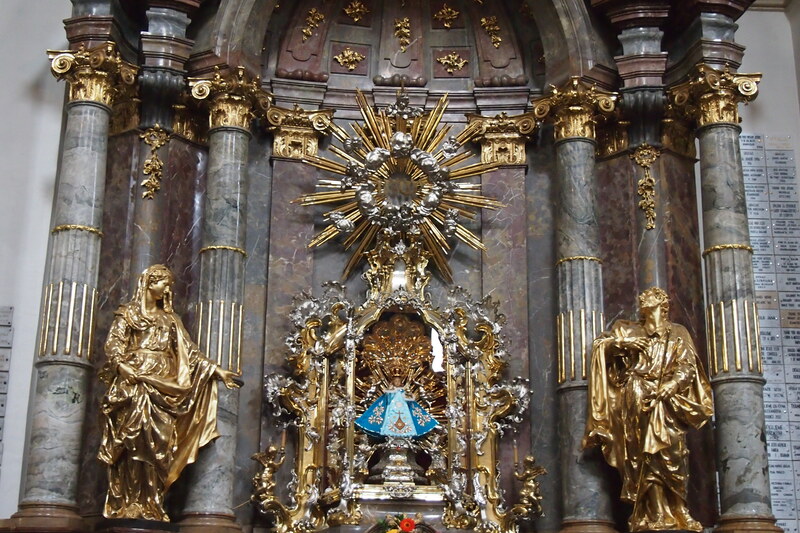 Various miracles have been attributed to the statue – most notably for saving the entire city from plague and invasions, when entire armies would inexplicably withdraw their armies after the city prayed in front of the alter of the infant Jesus. There are many devotees to the Infant Jesus and there is a room off to the side of the alter where various presents from its devotees are showcased. Perhaps the most famous of this is the garment sewn by the Empress Maria Theresa. 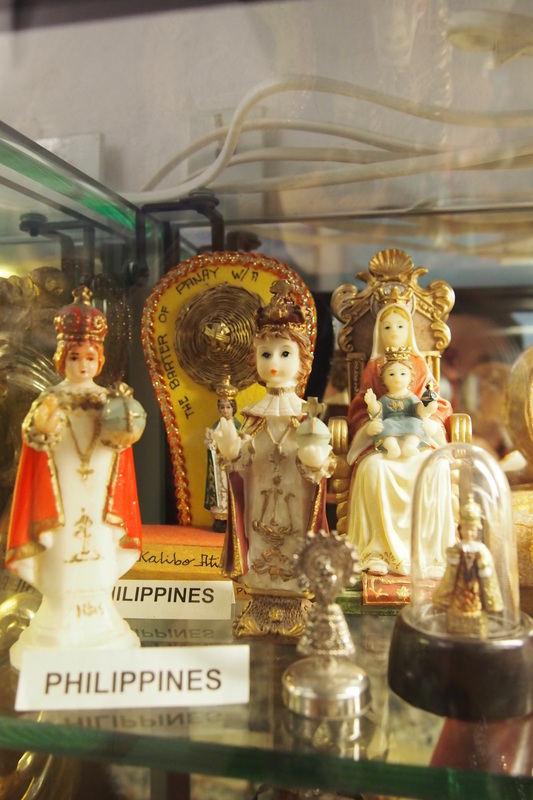 I spied a number of presents from fellow Filipinos in the glass cabinets – indeed, I felt immense pride upon learning that the choir (we attended the Sunday mass at the church during our trip) is mostly composed of Pinoys. And there were many Pinoys attending the Holy Mass with us. I am not really fond of religious statues (except for the rosary and the crucifix) but I bought a small Sto. Nino for our little home. I felt so blessed visiting this Church and quite touched that the Mass was well attended. 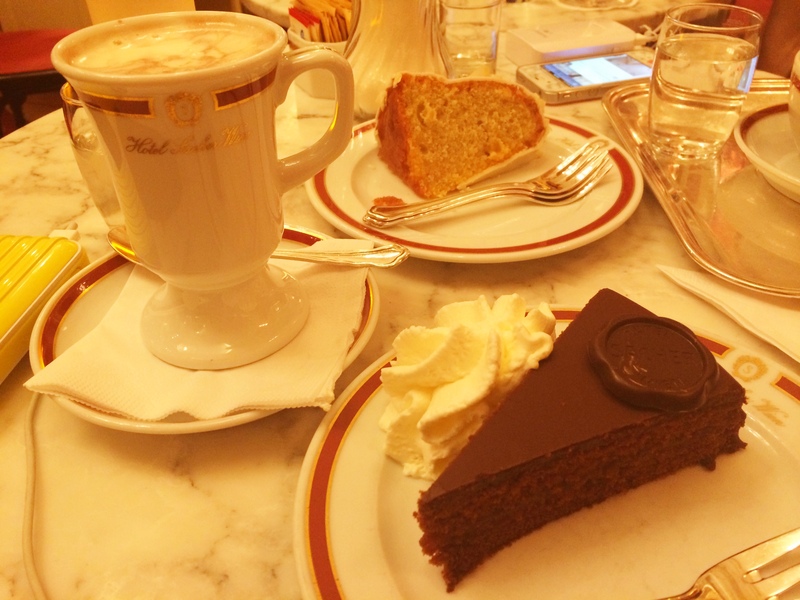 There are so many things to see and do in Vienna that we barely scratched the surface with just three whole days. 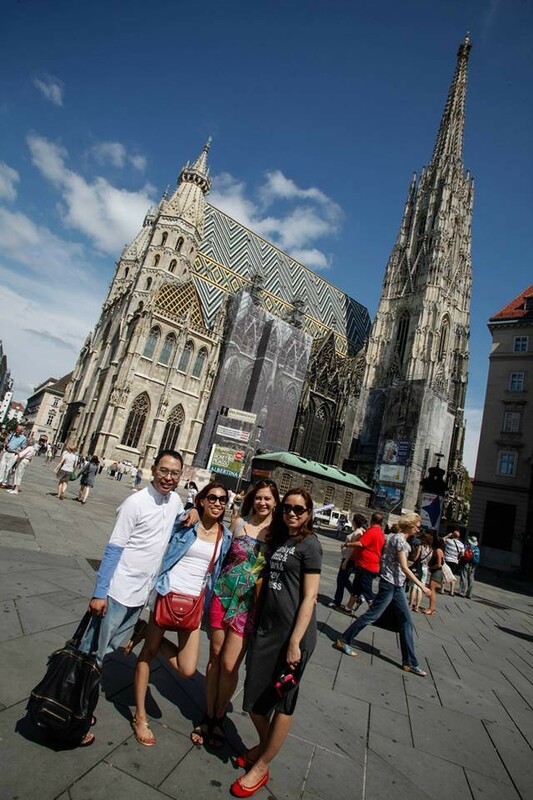 A good thing that our Varsi friends Gizelle and Harold took the time to tour us around the city the entire time! On our first day, since we were still a bit tired from our overnight train from Milan, we just stayed close to our hotel and walked around our neighborhood. 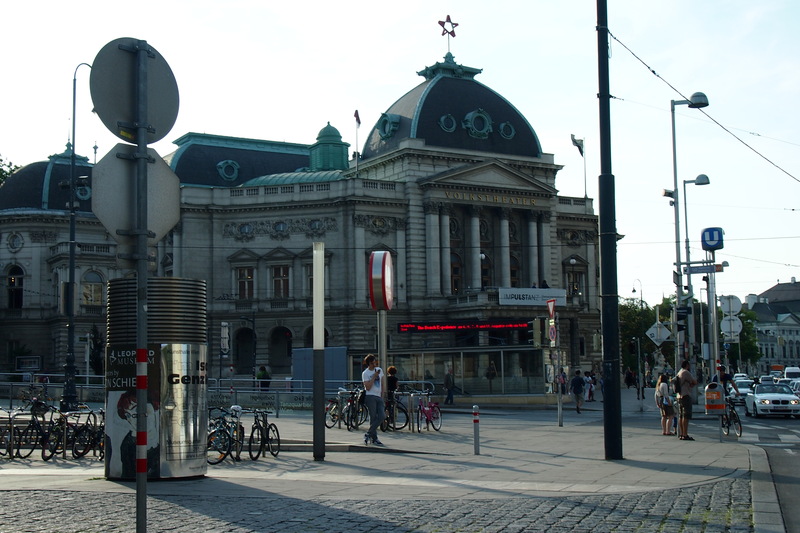 We’ve been lucky so far in all our hotel bookings, and so all we had to do was step out our hotel and voila – the St. Stephensplatz was at our doorstep. 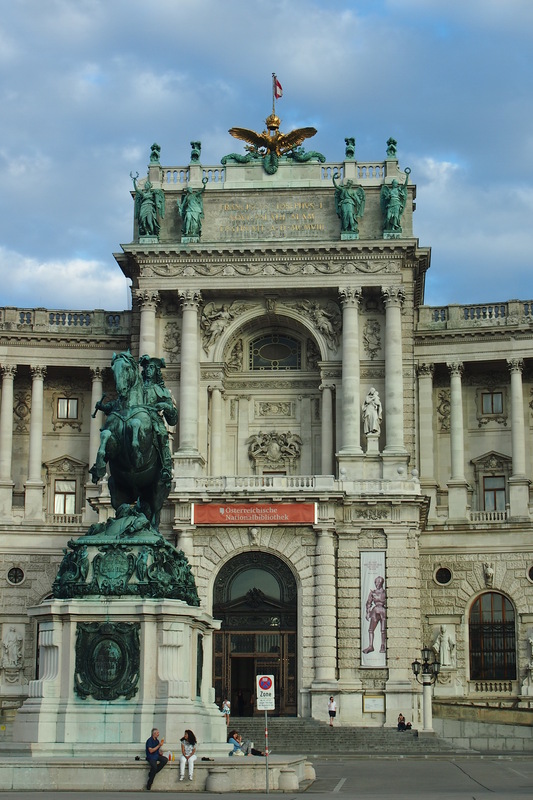 Just a few more paces and we found ourselves looking up at the Hofburg Palace, the former imperial winter palace. 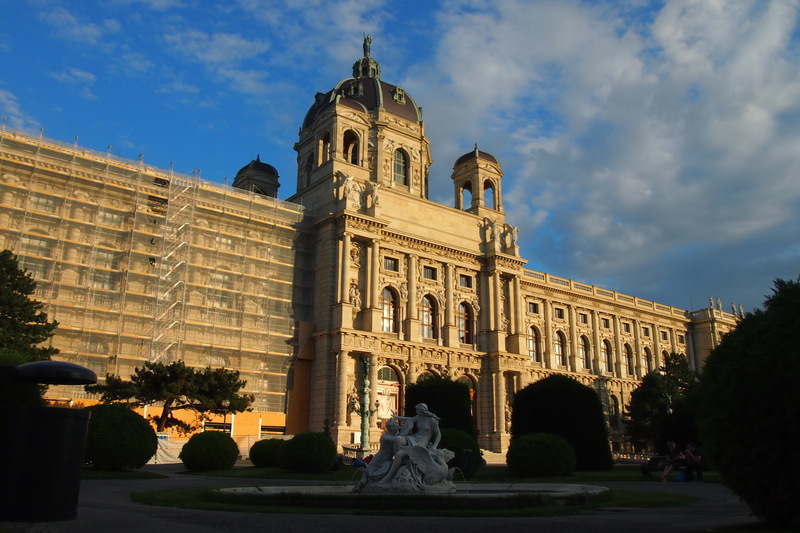 It is now the official residence and workplace of the Austrian president. It is a very grand structure composed of many buildings and halls, and though it occupies a massive amount of space and the architecture is by no means inferior, it is still less imposing than the Louvre or Versailles in France, and I couldn’t help but wonder that it also seems to be very open to the public. I mean, there were uniformed guards and all, but the palace grounds were pretty much accessible to everyone. 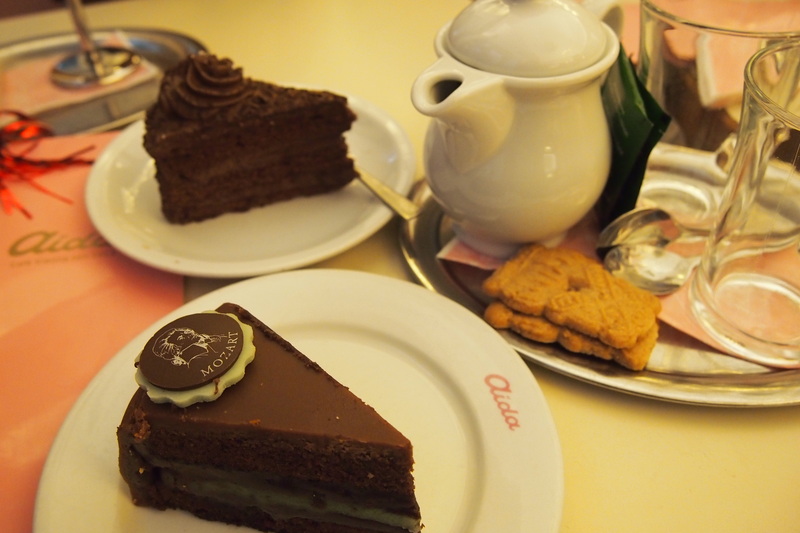 As I mentioned in one of my previous posts, Vienna is also home to many famous musicians, and Wolfgang Amadeus Mozart is one of them. 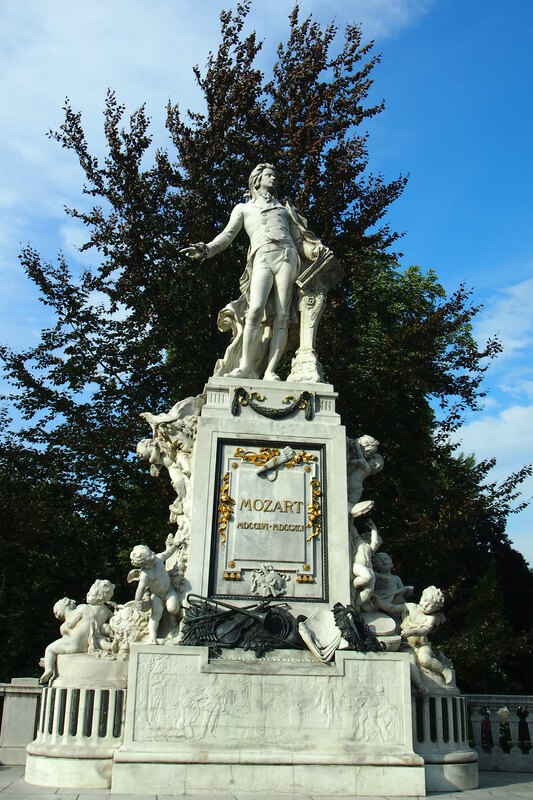 It’s no surprise then to find a statue of Mozart occupying prime space in the Burggarten (imperial garden) of the Hofburg Palace. 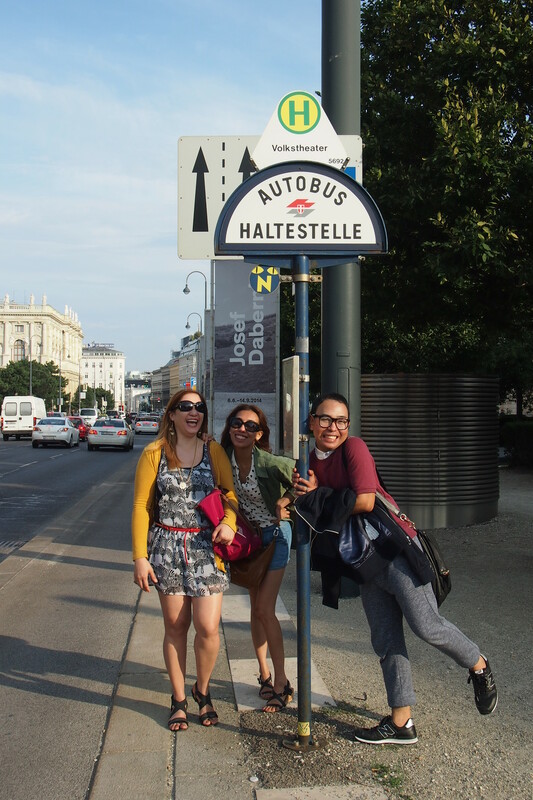 I am not sure how many miles a day we walked in Vienna but the weather was always perfect for strolling that I didn’t really mind. 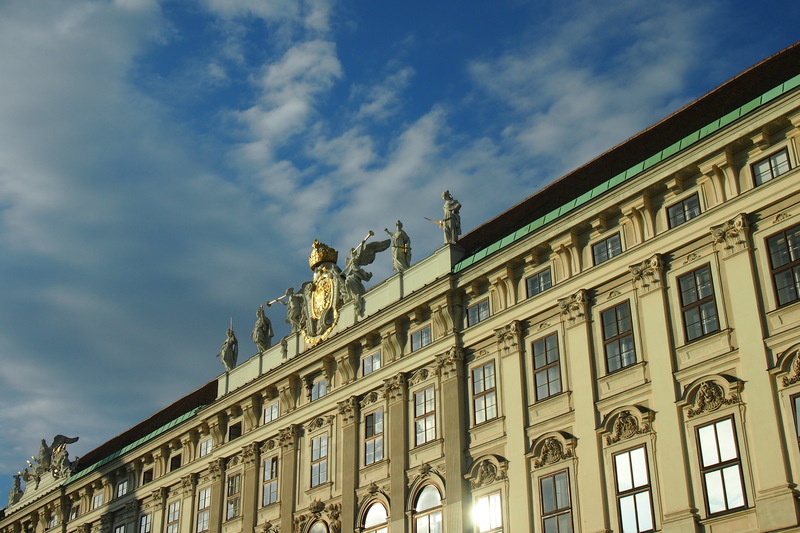 In one of our excursions, we also viewed the Karlskirche, or St. Charles’s Church, which can be found near the southern end of the Karlsplatz, one of the plazas or squares abundant in the city, and which is just next to St. Stephansplatz. 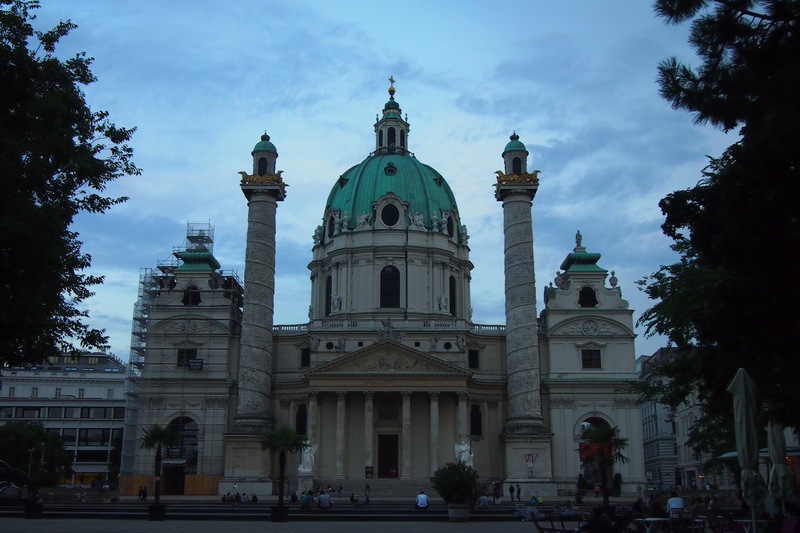 Built in the early 18th century under the patronage of the Holy Roman Emperor Charles VI in honor of his namesake saint Charles Borromeo, it is considered the most outstanding baroque church in all of Vienna. It is very pretty, especially at night when the long reflecting pool in front of it casts a somewhat luminous glow on it. 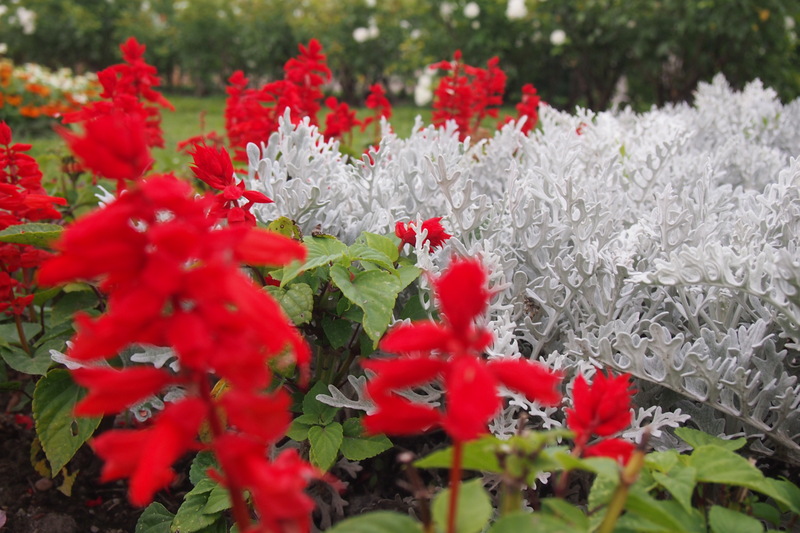 I was too busy looking at it (and tired from walking) that I forgot to take a photo of it at night. My bad. 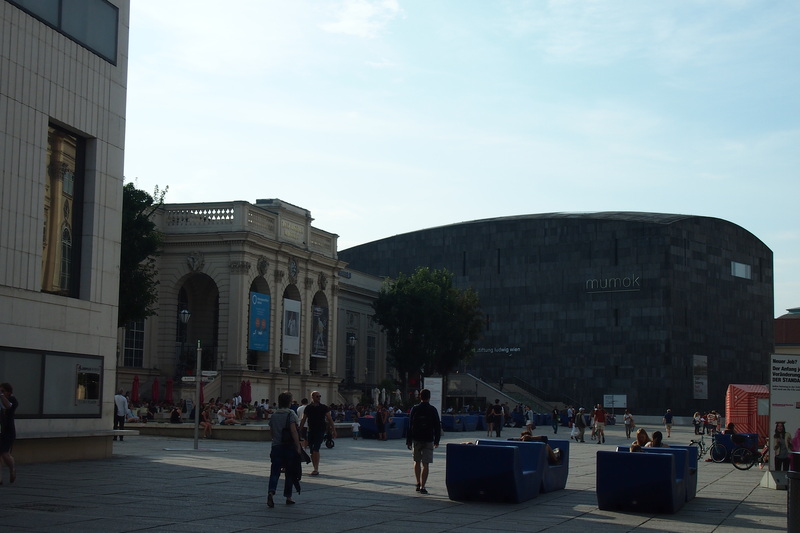 We didn’t really have time to go to a museum in Vienna (we did spy the Mumok), other than visit one of the exhibits, but their museum square is something that I was really fascinated with – side by side are plenty of museums, galleries, and exhibition halls. In the open area between museums is a large square where various art installations are displayed. There is also a dipping pool where a lot of locals and tourists alike rest their tired feet. I was so tempted to splash around! 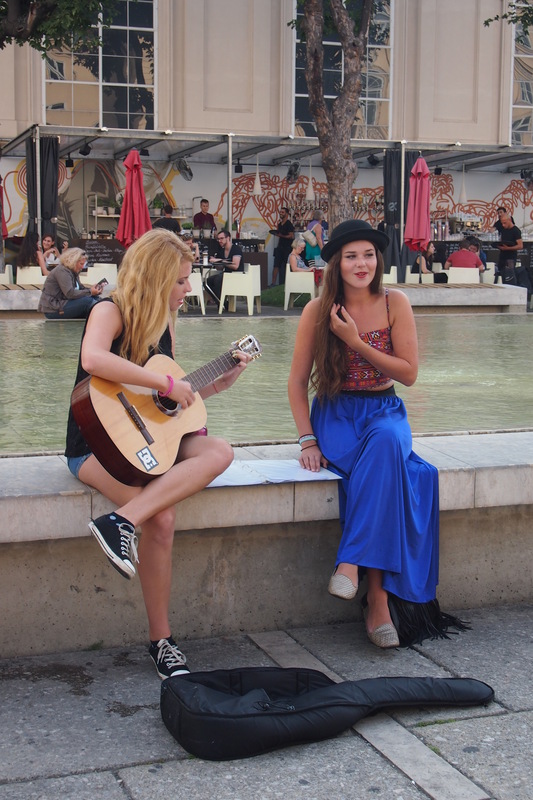 We also found these two pretty girls providing free entertainment – I forgot from which country these girls were from, but they told us they’re aspiring singers and they are practising by singing here at the museum plaza. I love the gypsy/country vibe they had going, and the brunette had quite a unique style in singing. 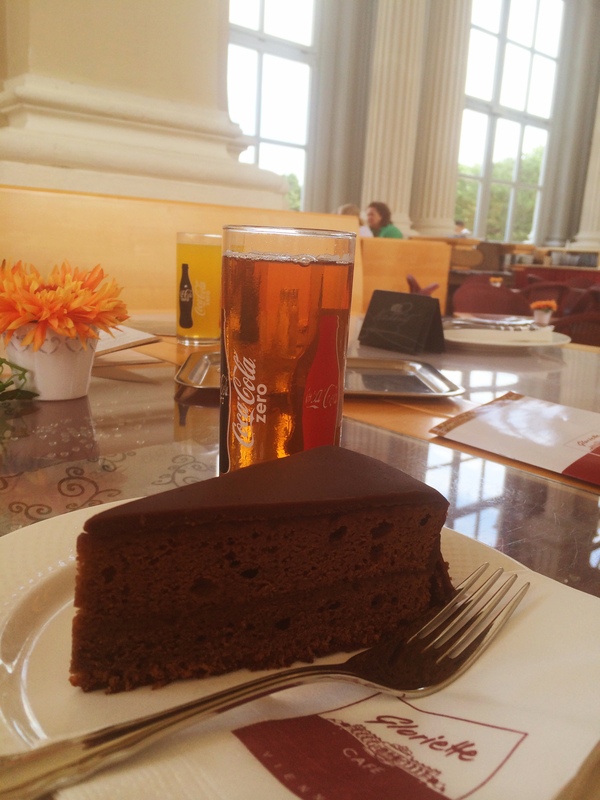 Vienna is probably one of the most beautiful cities I’ve been to, and I can easily understand now why it’s been at the top of most livable cities list – aside from its obvious beauty, it has a rich culture and history, and a deep appreciation for the arts. 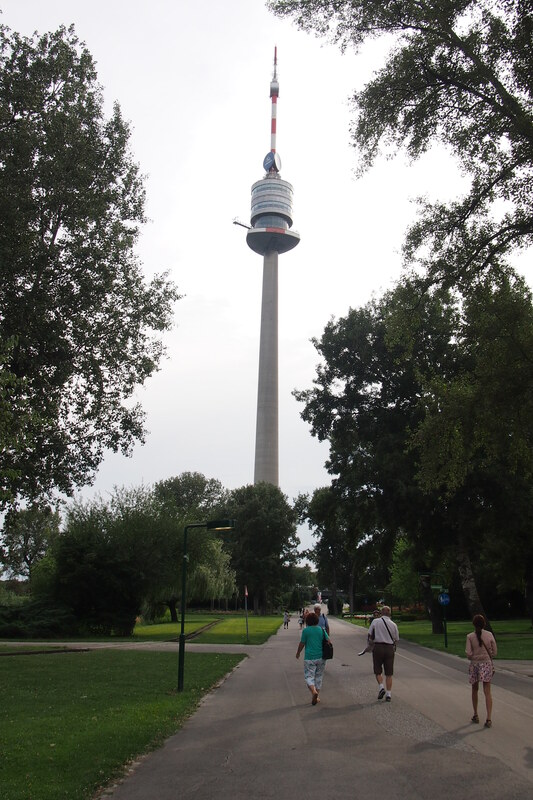 One our our last stops before we headed to our next city was the Donauturm (Danube Tower), the tallest structure in Austria. 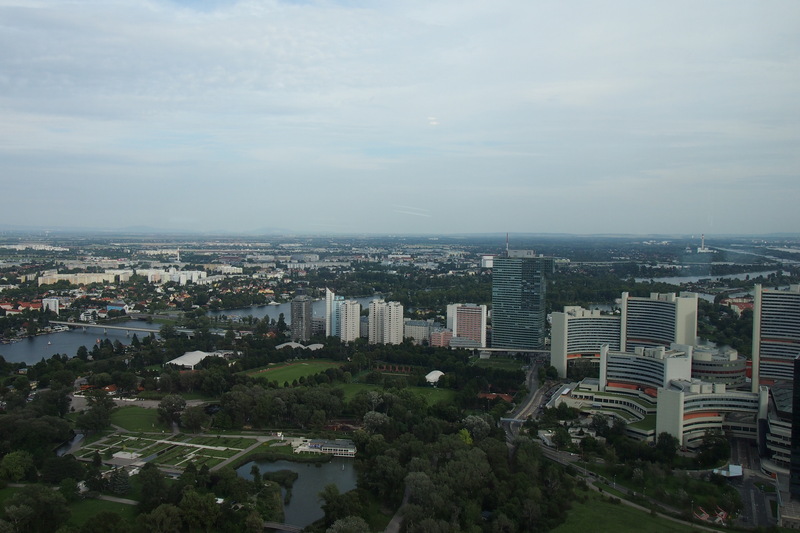 It was opened to the public after 18 months of construction, in time for the Viennese International Horticultural Show in 1964, and is located in the middle of the Donaupark, itself built to host the horticultural fair. I have a fear of heights so it took a lot of gulping and praying before I got the courage to ride the high speed elevator (35 seconds to go up 150 meters!) all the way to the viewing deck of the tower and while my knees turned to jelly and I could barely hold my camera in my hands (I was shaking so badly my knees almost buckled), the sweeping views of the city was more than worth it. 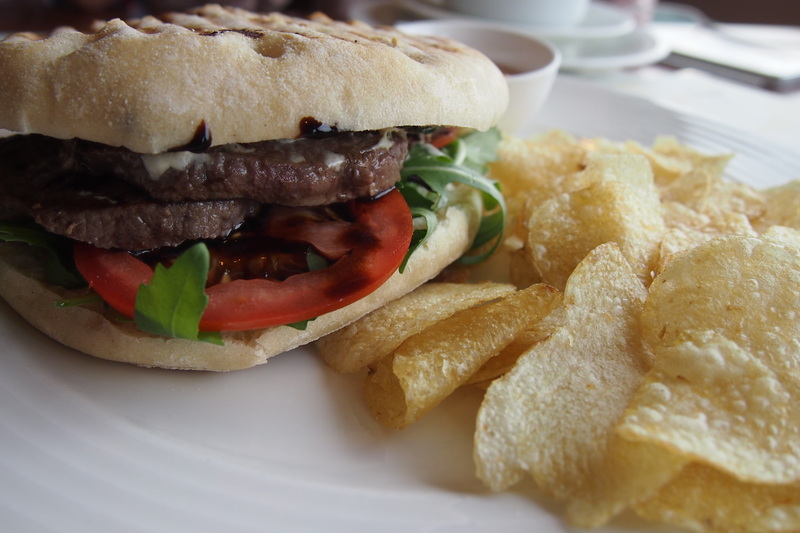 There are also two revolving restaurants at the top of the tower and we were lucky that the place wasn’t full – we waited for only a couple of minutes before we got a cozy table which afforded us different views of the city at every turn. 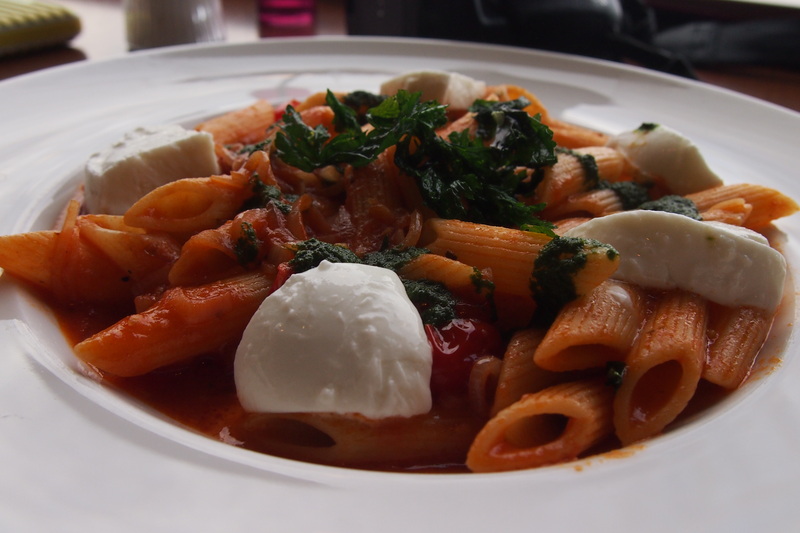 It was my first time at a revolving restaurant (I have yet to try our very own here in Manila) and I loved it! I mean, the food was great and where else can you get such unobstructed views of one of the most beautiful cities in the world? My travel buddies. We were tired but very happy! 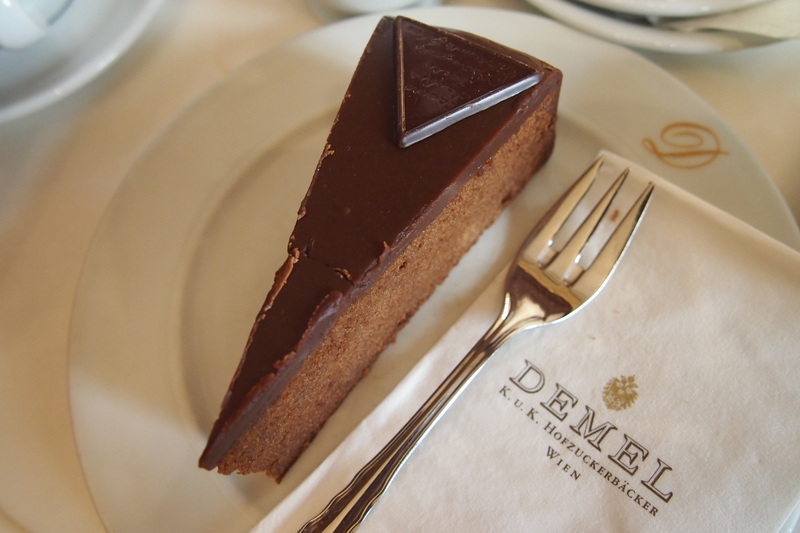 So long, farewell Vienna! Until we meet again! In most of the European cities I’ve been to, the center of activity revolves around the parish church, or cathedral, if the city has been declared a diocese and this proves true as well in Vienna, perhaps even more so, since the main shopping and cultural area of the city is located in the Saint Stephansplatz, where the Saint Stephen Cathedral (or Stephensdom in German) is located. 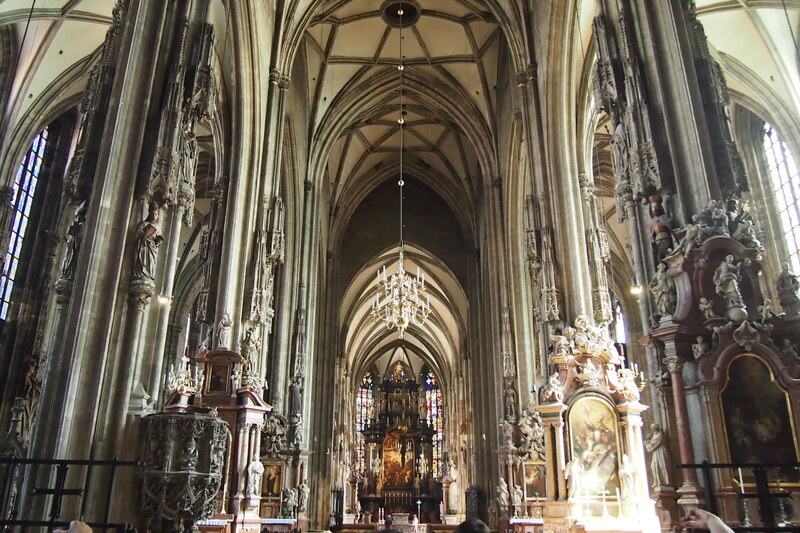 Consecrated in 1147, it was hardly the oldest church in Vienna; however, recent excavations inside the cathedral revealed graves that have been carbon-dated to the 4th century, suggesting that it may have stood on an even older religious building. It was named after Saint Stephen, tthe earliest known martyr of Christianity, stoned to death on accusations of the Jewish authorities. Trivia: Saul was one of the witnesses at his death, when he still believed that he was serving God by persecuting Christians; he later converted after witnessing a bright light on his way to Damascus, converting into the saint we now know as Paul. The building is of limestone, which over the years has been covered by soot and dust; recent restorations have brought it back to its original white. The south tower of the cathedral, called steffl by the the people. stands at 136 meters, and was used as an observation and command post for the city, and at one point even had an apartment for the watchmen. 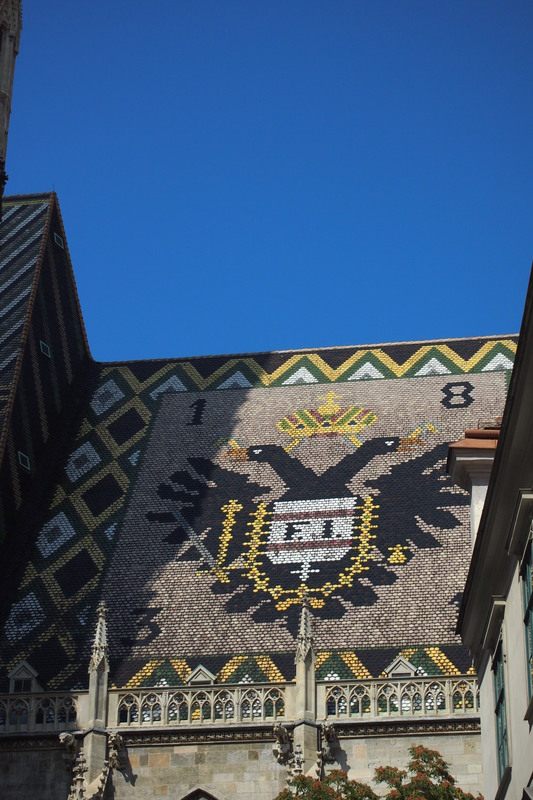 The roof of the church, on the other hand, is made of ornately designed glazed tiles, forming the Royal and Imperial double-headed eagle and the coat of arms of Vienna on one side. It’s quite steep and I’ve read that due to this, only the rain cleans it every now and then. I wonder how they built it though and how many accidents must have happened! And I can’t believe that one point, this church was in fact ordered to be razed to the ground along with the rest of the city when the Germans were retreating during World War II; thankfully, Captain Gerhard Klinkicht disobeyed orders and left the church intact. Near the entrance to the catacombs is the church’s original pulpit, the Capistran Chancel, where St. John Capistrano preached to a crusade to fight the invading Muslims in the mid-15th century. It shows St. Francis stepping on a defeated Turk, with a sunburst above his head. Our hotel was located just a stone’s throw away from the Cathedral (to our pleasant surprise), but I didn’t get to go inside until our last day. My friends and I decided to split up (we couldn’t agree whether to go shopping or touring; my friend Leah and I chose the latter but ended in different destinations), and I as on an amazing race to tour the entire church in less than an hour. Tip: when pressed for time, avoid the guided tour and rent those headsets for a couple of euros. Both are extremely organized and I was surprised that such a well detailed and organized guide could be rented so cheaply (so I donated a couple more euros to the church’s coffers). I was awed by the number of carvings and the fact that for an old church, it didn’t smell musty. I could tell that this church is frequented by Catholics and tourists alike, judging from the number of lit candles as well as the long row of tourist waiting to get in to tour the cathedral, or the catacombs underneath. I would have gone to see the latter but after my experience in Milan, I didn’t want to go by myself (never mind that I spied a lot of tourists going down the stairwell leading into the catacombs). I am no architecture major (though the thought did cross my mind at one point), but I have come to realize that thick posts are easily identifiable features of Gothic architecture and while this is common in many churches in Europe, St. Stephen’s is embellished by colorful statues of saints in ornately carved alcoves, albeit some of them have faded a bit. 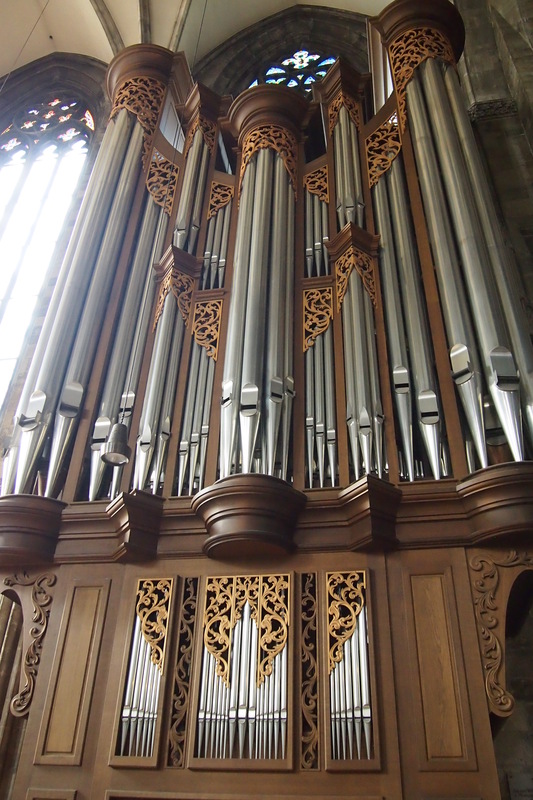 It also boasts of a huge organ, though not that old at only a litle over half a century. 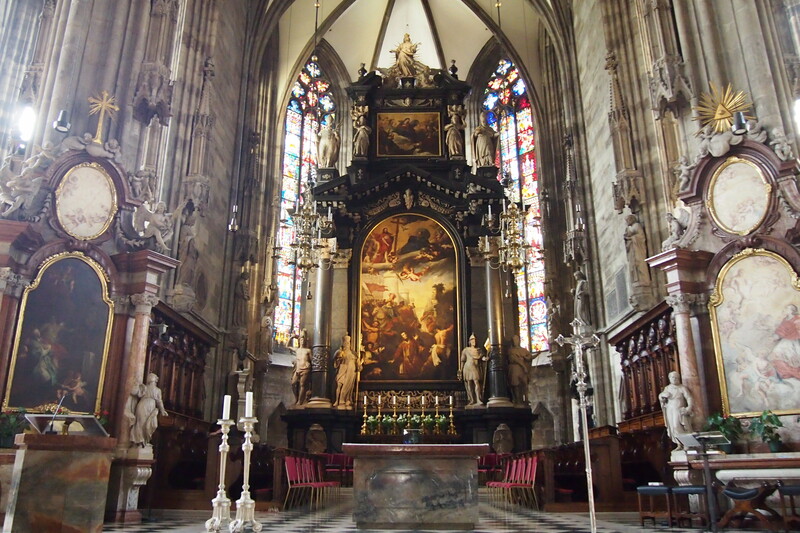 The high altar of the cathedral is perhaps the first thing that would draw a visitor, since it is right in the middle and you just can’t tear yourself away from the magnificent paintings and carvings. 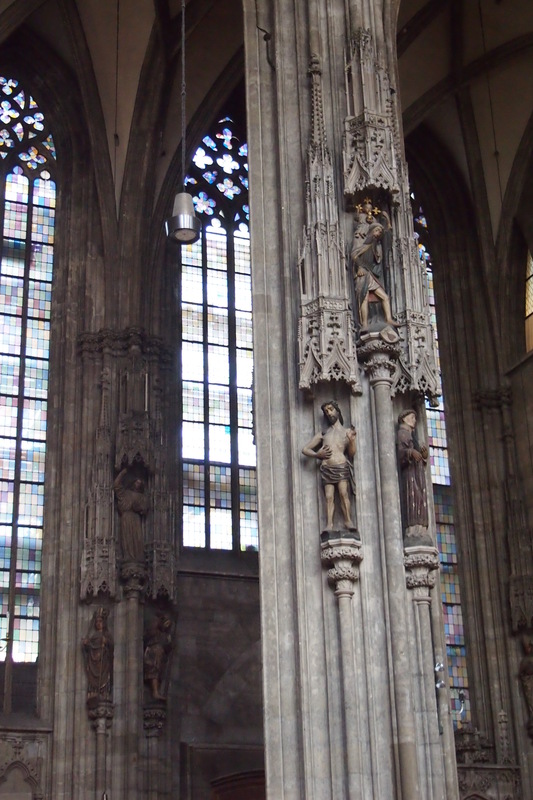 It shows the stoning of St. Stephen, surrounded by figures of four saints and a statue of Mary on top. And I must say the stained glass windows are also very vibrant and lovely to look at. 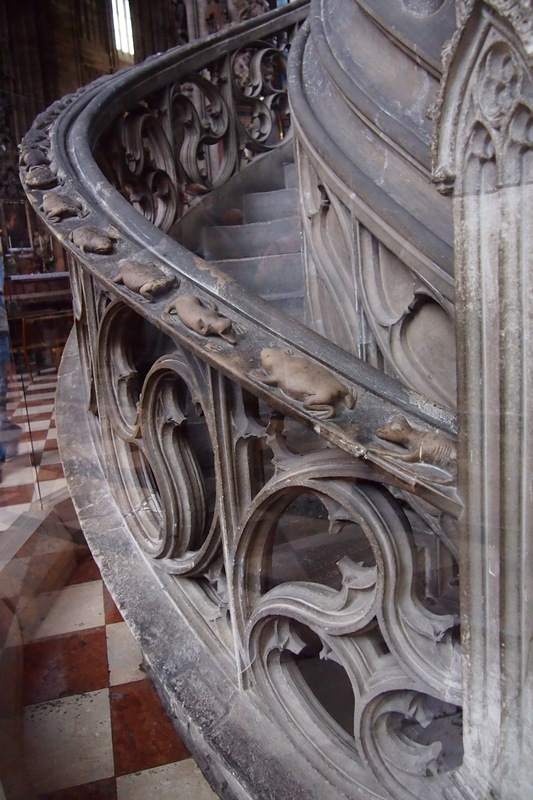 There are many objects inside the cathedral which I found very interesting, not the least of which is this stone pulpit. 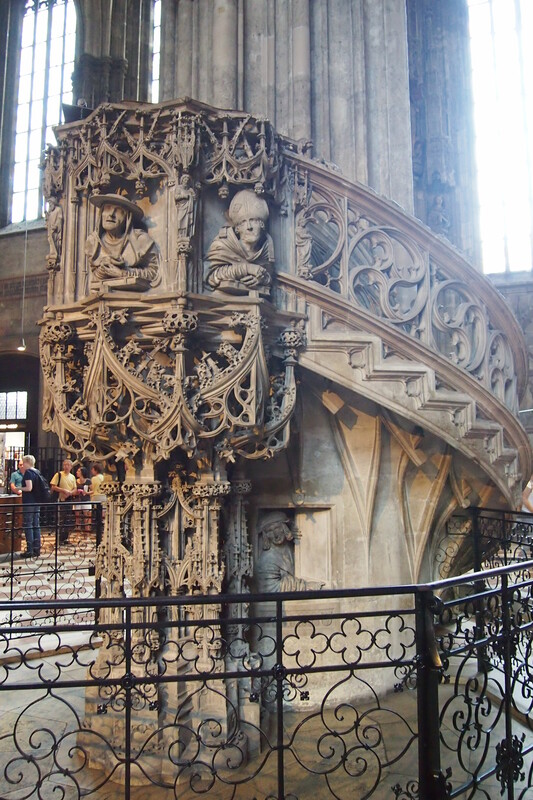 I’ve seen many grand pulpits in Europe but this probably takes the cake in the way the sculptor paid attention to the tiniest detail – even the portions not easily seen by a casual observer was not spared. It shows the faces of the four doctors of the church: St. Augustine, St. Ambrose, St. Gregory the Great and St. Jerome). What I even found more interesting is that the rails going up the pulpit had carvings of frogs and lizards fighting each other; I later found out that this was a symbol of the fight between good and evil. At the top of the stairs, there is even a puppy to protect the preachers (how cute is that!). 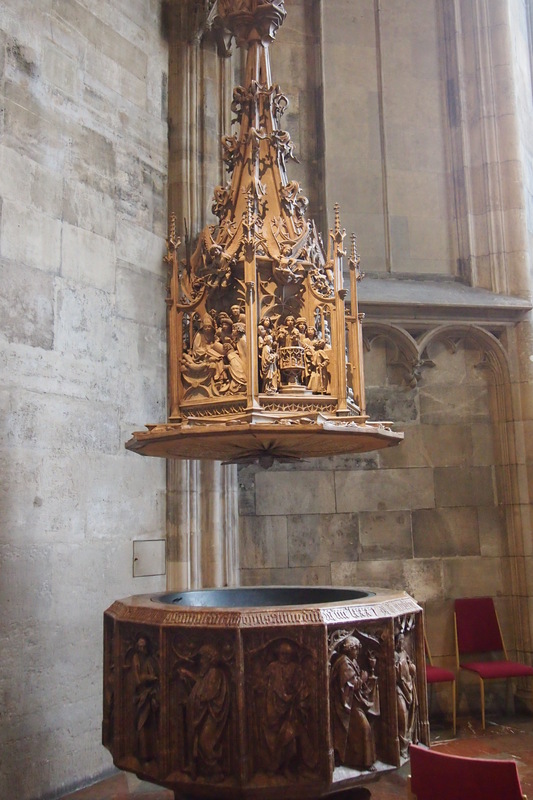 Even the baptismal fount was TDF! I normally find it creepy whenever I see tombs in conspicuous places inside churches, never mind that it is undoubtedly a great honor to be buried inside a church. While this one is no exception, I can’t help but agree that if I had a tomb this beautiful, I would want the whole world to see it too, which is probably what the church officials where thinking when they put Emperor Frederick III’s tomb on display, during whose reign, in 1469, Vienna was finally declared a diocese. Such a massive tomb took 45 years to complete, beginning more than two decades prior to his death. 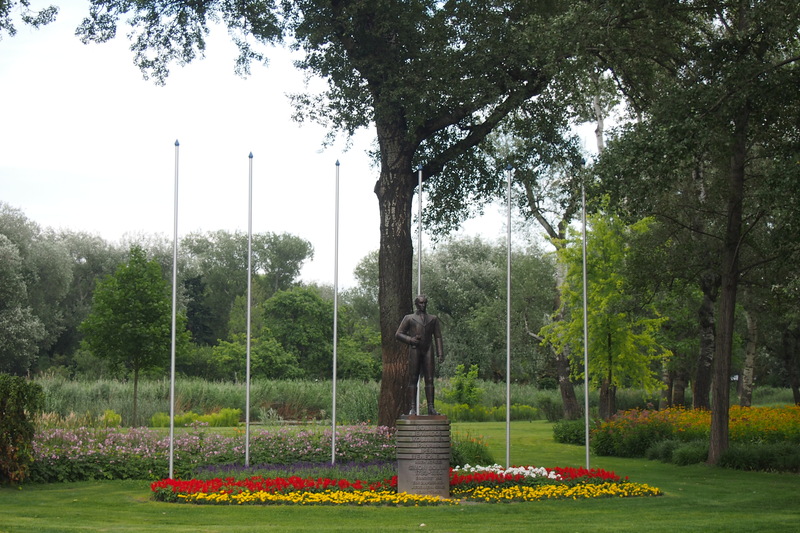 It is made of red stone and depicts the emperor in his coronation regalia. 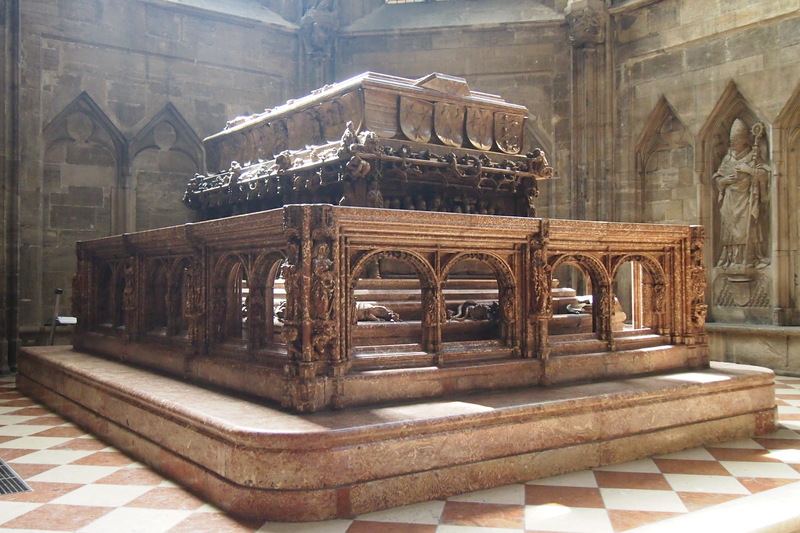 The tomb of Prince Eugene of Savoy (I first wrote about him in my post Belvedere Castle) is also located inside the cathedral, In the Chapel of the Cross, but this is off limits to the public. The Ducal Crypt, located under the chancel of the cathedral, is also the final resting place of 72 members of the Habsburg family. 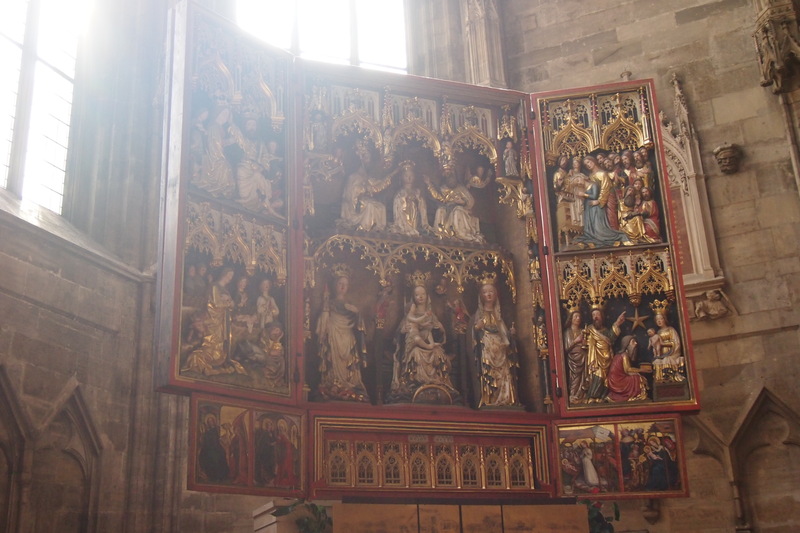 Saving the best for last, is perhaps my favorite piece in all the church – the Wiener Neustadter Altar which was originally used in the Cistercian Viktring Abbey, and later the monastery of St. Bernard of Clairvaux, until it was finally sold to the cathedral in 1885. Ordered by Emperor Frederick III, tt is just so beautiful, with the double triptych opening up to reveal gilded wooden figures of Mary. When the panels are closed (during weekdays), it shows a painting of 72 saints. 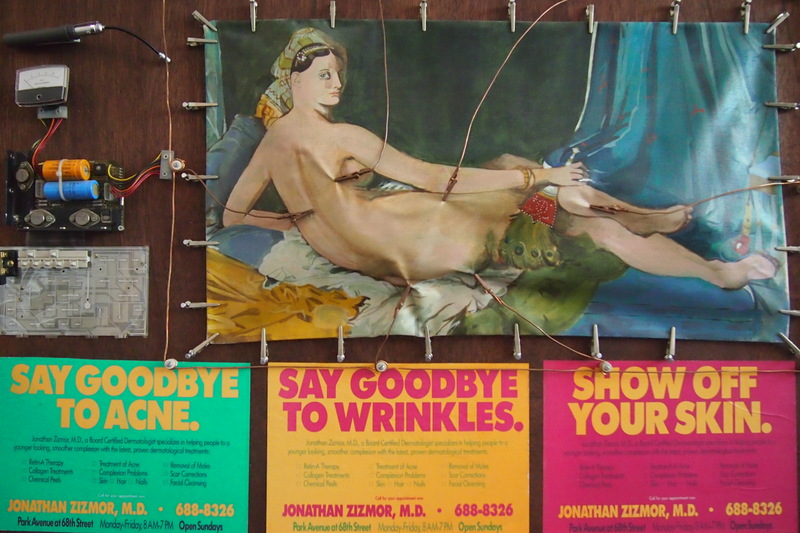 It’s a retablo and triptych all rolled into one. There are so many beautiful churches in Europe and it is getting hard to play favorites; I had always thought the Notre Dame in Paris would be the clear winner in my books but with more than ten cities and seven countries visited in the continent, I am now not so sure. 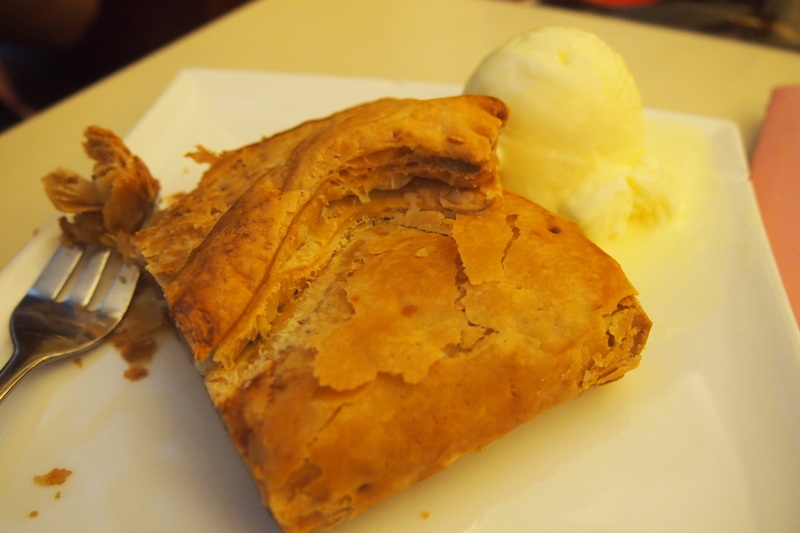 Each of them have unique features that distinguish them, and make them works of art.